I've been cursing ketchup packet manufacturers for quite literally decades for their tiny, inadequate fast food condiment offerings. They're awful. Palatability of a seven year old tomato-vinegar paste aside, there's just not enough of it. Twelve. Twelve packets it takes for me to have a sufficient enough puddle of dipping sauce for my French fries. Honestly, opening them and squeezing their contents onto a little paper wrapper is tiring and messy. I understand the concept of using a minimal number of packets and recycling unused ones, but it can't possibly be cost effective. It just can't. How many times to the two extra packets that escaped the reaping of your mighty handful end up in the garbage, either by your hand or that of an over-eager busboy? That's a waste. And all that packaging for–what?–maybe a quarter-ounce of non-Newtonian solid? 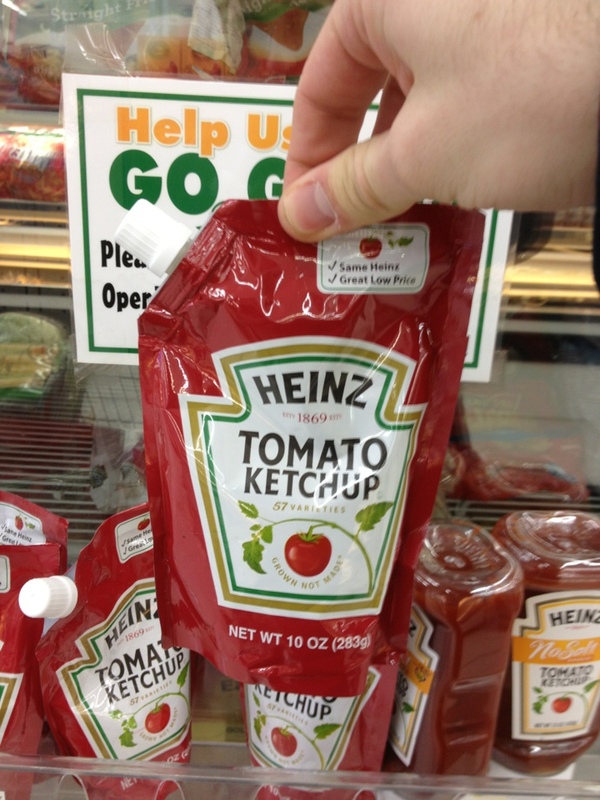 You could save much more money by just doubling the amount of ketchup per packet. Wendy's does fairly well with a dip/squeeze combo packet, though it doesn't work nearly as well as a squeeze-only. Why not just make a larger plastic pack?? Thank you, Heinz. You have never steered me wrong. Not once. Not even with green ketchup. You r funny labels? Actually funny. Your flat caps for gravitational assistance of fridge storage? Actually on the bottom. And now, you've improved the ketchup packet. Bravo, sirs. I plan to purchase one of these for my stash of food at work, for every time I get fries but don't want to spend the money on a full bottle.